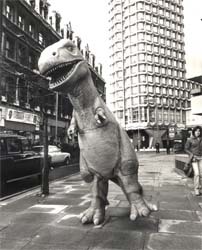 Darren Rea: Forbidden Planet opened its first shop back in 1978, can you tell us what was behind the decision to open your first store? Nick Landau: There's a rather strange reason for opening the first store. 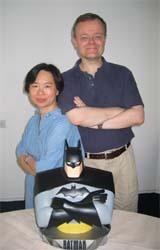 At the time I was a distributor for imported comic books. One of our largest customers was about to go out of business and if they did we would probably have gone out of business. I know there should be a more exciting mythology than this... but that's how we started. 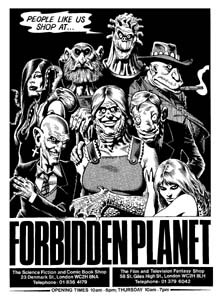 Partly as a form of protection for our distribution business we opened the very first Forbidden Planet in Denmark Street. It was located in 'Tin Pan Alley' which is the legendary music street where numerous bands were said to have formed. The Rolling Stones, and various other famous musicians, were regulars at the cafe across the road. Because we were in the middle of the whole music scene Forbidden Planet took off very quickly. The timing was also very good because we opened not long after Star Wars was released and then once we were open it wasn't long after that Alien came along. I think we were very lucky that we developed a cult status very early on. We'd get a lot stars and directors coming into the store. I remember getting the call from on high to go and see Ridley Scott when he was about to make the Dune movie - which of course was actually made by David Lynch. And even though we were only really retailers he wanted consultancy services because he felt that we knew what we were doing - although we were faking it a bit. He was looking for storyboard artists and we ended up providing him with a number of people from the comic book industry. We've always had a reputation for having a lot of signings. 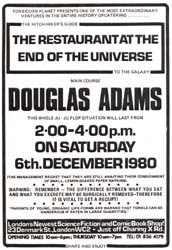 One of our early signings was with Douglas Adams and I was surprised to see that his first Forbidden Planet signing was referred to as "The legendary Forbidden Planet signing" in his biography. We hadn't bought enough copies of his latest book from his publisher and so we were rushing around the West End buying every copy of the Hitchhiker's Guide to the Galaxy to bring back to sell to this enormous line of about 1200 people. DR: Which, for you personally, has been the most exciting guest you've had in for a signing? NL: The exciting ones are your heroes. Sometimes when you meet them they are not as exciting as you thought, while other people you thought wouldn't be as exciting surprise you. We had a very unusual signing with Arthur C. Clarke. He had said that he didn't want to touch the book so we had to sign the pages as he signed his name. He also only wanted one person in sight as he walked into the room. He was lovely, but the quirkiness of it all was very strange. I won't mention names here, but we've had some top names in the business who have consumed many bottles of scotch and then tottered perilously down the street to the store and our biggest fear was that those authors would be run over by a car on the way to the store. When we opened the New Oxford St store we invited Adam West who played Batman in the '60s. We got a batmobile along for the occasion and the driver did a horrible sharp U-turn in front of a double decker bus as he was approaching the store. We almost disposed of both Adam and the batmobile. 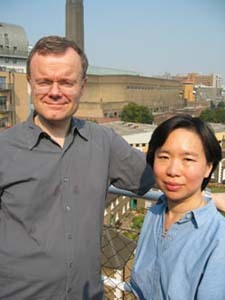 Vivien Cheung: They are wonderful. They talk to people so everybody walks away feeling a little bit special because they have talked to their hero - that's the wonderful thing about that, but obviously it does take time. DR: You've just opened your new flagship store which is nearly twice the size of the old store in New Oxford Street. Do you think that the recent hit of sci-fi shows like Buffy have helped keep the market buoyant? NL: We like to think that the market has caught up with us a bit, in terms of the movie stuff but that's probably being a little over pretentious. I think that it's down to the fact that over the years we have seen an increase in science fiction and comic based films and television. VC: I think the media has helped a lot. 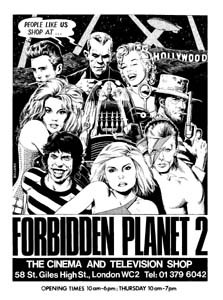 When Forbidden Planet started sci-fi on television had only just really started. The original series of Star Trek and Doctor Who were probably the only real sci-fi shows on. Now it is more accessible to a larger market. DR: Have there been any items that you have refused to stock on the grounds of good taste? NL: We have many different reputations. 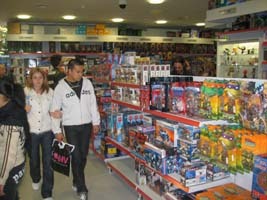 Forbidden Planet, as a concept, represents a collection of fan bases. This stretches from the soft end of the scale - say Thunderbirds or The Simpsons - to things of a far more extreme nature (things like the Asia Extreme video nasties). We are there to satisfy all of the different fanbases and we've never gone in for censorship. Forbidden Planet has always been kind of edgy in its approach to things. I remember when the first or second Hellraiser movie came out and we had Frank on loan and we put him in the window. And within five minutes of putting the skinned Frank in the window we had the police round because some little old lady thought that it was the most obscene thing she had seen. VC: Also when The X-Files has the foetus in the tube we put that in the window and again we got a complaint and so we put a sign saying: "This came from The X-Files" [laughs] so that everybody knew it was part of a prop. I think that once you put it in context so that people that it does come from somewhere rather than us trying to gross people out. DR: A lot of people come down to Forbidden Planet to blow a large chunk of their salary each month. Where do you both go when you want to spend some money on a hobby? NL: We're actually very sad in as much that we just sit in the office and get on with the next project. 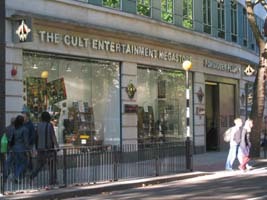 We also run Titan Books and Titan Magazines and are busy all of the time. 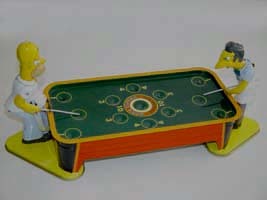 So in terms of blowing large wads of cash... That would be something we'd both love to do if we had the time. VC: It's still fun to go to the Far East and roam the markets there. You actually get a wide variety of trashy stuff. That's fun to do, and once in a while you get little gems that you can bring back here. There is a huge variety that we are not stocking and there is a selection process. DR: What of the future. Do you see yourselves opening stores abroad? NL: We actually did once. We had a store in Los Angeles but found that every time the cash register went wrong we had to jump on a plane to fix it. As our new store shows, we are trying to produce a strong environment for collector's as well as the general public. We want something that will appeal to everybody. We have an entrance to die for now for the new store. In the past the problem was making the outside look inviting. VC: There's also more room. So it's no longer your tightly packed hobby store. DR: Thank you for you time.